← Are Big Banks’ Dark Pools Behind the Run-Up in Bank Stock Prices? Let’s start with that last statement. According to our own Central Intelligence Agency, there are 55 countries that have a lower infant mortality rate than the United States. Even debt-strapped Greece beats the United States. Mentioning the rule of law in the same breath with our market system shows Buffett’s hypocrisy in the worst light. Millions of Americans are still seething over the fact that not one top executive on Wall Street has gone to jail for their role in issuing fraudulent securities with triple-A ratings that brought on the greatest financial collapse since the Great Depression. Millions of Americans are still waiting for the U.S. Justice Department or the Securities and Exchange Commission to address the well documented market rigging charges that Michael Lewis made in his book, Flash Boys and on 60 Minutes. Millions of Americans have lost trust in their Congress, now with an approval rating of just 19 percent, to impose legislation to stop the serial crimes that continue to spew from Wall Street. Tens of millions of Americans believe that Wall Street’s financing of political campaigns has so completely corrupted the U.S. market system that it has become an institutionalized wealth transfer system from the pockets of the 99 percent to the 1 percent. As the ever-expanding raps sheets of JPMorgan Chase and Citigroup make clear, there is strong evidentiary support for this view. Millions of Americans clearly understand that those pockets, increasingly, belong to the 1 percent billionaire class who are gaming the system with a wink from our Congress. Since at least the 1990s, Wall Street’s radar in directing capital has been landing crashed heaps of jumbo jets on the financial runways of America. As dozens of lawsuits and Justice Department settlements have spelled out, in the lead up to the 2008 crash, Wall Street was paying rating agencies to deliver triple-A ratings to hundreds of billions of dollars of pools of subprime mortgages that they knew were destined to fail from their own in-house reviews. Less than a decade earlier, Ron Chernow described for New York Times’ readers how Wall Street’s broken capital allocation system had brought on the dot.com bust. Chernow wrote: “Let us be clear about the magnitude of the Nasdaq collapse. The tumble has been so steep and so bloody — close to $4 trillion in market value erased in one year — that it amounts to nearly four times the carnage recorded in the October 1987 crash.” Chernow compared the Nasdaq stock market to a “lunatic control tower that directed most incoming planes to a bustling, congested airport known as the New Economy while another, depressed airport, the Old Economy, stagnated with empty runways. The market functioned as a vast, erratic mechanism for misallocating capital across America,” Chernow correctly observed. Buffett has a built-in conflict that apparently prevents him taking off his rose-colored glasses when it comes to Wall Street. 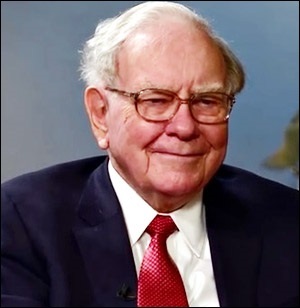 The company where the bulk of his wealth is invested, Berkshire Hathaway, owns $2.7 billion of Goldman Sachs stock; $27.5 billion of Wells Fargo; and $5 billion of Bank of America preferred stock. Denying that America is headed in the wrong direction; denying that Wall Street has become hopelessly corrupted won’t get the problems fixed. It will ensure that today’s young generation will become debt slaves to Wall Street and the one percent. Don’t allow Buffett’s facade of homespun folksiness to distract you from the hard facts.